The upcoming Central Scotland Celebration of Hope (June 15-17) follows the 2016 North East Scotland Celebration of Hope in Peterhead. Approximately 4,800 people attended that event in a community with a population of 18,500. More than 240 responded to the invitation to make a commitment to Jesus Christ. “Gie it laldy,” an old Scottish saying goes. Meaning—to do something with gusto. That’s how Will Graham, who’s three-fourths Scottish himself, will likely present the Gospel at the Central Scotland Celebration of Hope in Falkirk. Will is returning to Great Britain just two years after the 2016 North East Scotland Celebration of Hope In Peterhead. 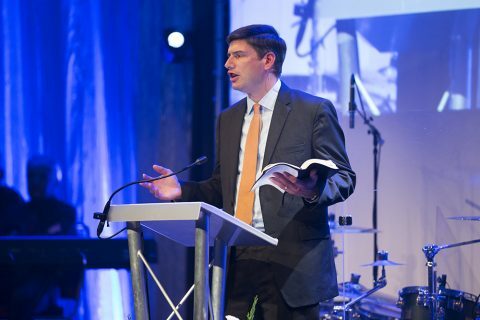 At the Celebration launch in January, Will shared his burden to reach people for Christ in Central Scotland. 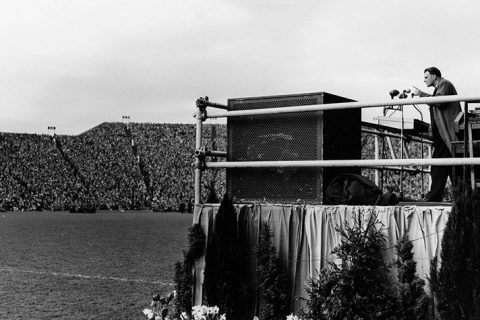 In 1955, his grandfather, Billy Graham, held a multi-city Crusade during a great spiritual movement in the country. Back then, about 50 percent of Scots attended church regularly. Today, only 7 percent do. There are encouraging signs of revival though. In February, over 300 people went through the Billy Graham Evangelistic Association’s (BGEA’s) discipleship training in nine locations. The same month, 1,500 people in 16 locations attended the Christian Life & Witness Course each week for three weeks. That many people strengthening their faith and becoming equipped witnesses for Christ is encouraging, said Celebration director Gary Cobb. Because in Scotland, like most places in the world, people aren’t that comfortable sharing their faith. One plus for the Celebration is the venue, Falkirk Stadium—which is familiar to football (soccer) fans. That could play out well for inviting non-Christian friends. “We’re on a neutral site, in a place where people are used to going for sport, and here’s an opportunity to reach your friend for Christ,” Cobb said. – Sits between the well-known cities of Edinburgh and Glasgow. – The Battle of Falkirk took place in the vicinity in 1298 after William Wallace led a rebellion against England. – Tourists travel to Falkirk to see the Kelpies, a pair of gigantic horse sculptures, and the Falkirk Wheel, the world’s first and only rotating boat lift. That’s why BGEA is promoting its “Be an Andrew” discipleship curriculum for the Falkirk Celebration. Embodying the spirit of Andrew (the first disciple to bring someone to Christ), “Be an Andrew” challenges participants to live out their faith by identifying those who need Christ, praying for them daily and helping others grow closer to God. “Be an Andrew,” formerly called “Operation Andrew,” was first rolled out at Billy Graham’s 1955 Scotland Crusade. With it, the number of commitments to Christ skyrocketed, from about 100 a night at the evangelist’s 1954 London Crusade, to 470 the first night in Scotland. Christians actually brought people who didn’t know Christ, said Cobb. BGEA isn’t the only ministry trying to change the spiritual climate in Scotland. Last month, The Turning held training meetings to equip believers for street evangelism. “I see God doing something in stages here,” said Cobb. “It starts with the BGEA training, then serving as a prayer volunteer at the Celebration, then maybe going to the other training about street evangelism and sharing God’s love that way. “We want to leave the church and movements like this stronger than when we got there,” he continued. “We want to make sure this is impacting the community and the church for years and years to come. God loves you. Maybe you believe in God, but have you accepted His offer of salvation? Over the course of six weeks, 2½ million people attended the 1955 Scotland Crusade meetings, with 53,000 people making decisions for Christ. Back then, about 50 percent of Scottish people attended church regularly. Today, it’s only 7 percent.